Some people trust their doctors and take their advice. But that's not always a good idea. Different doctors can have different opinions and they make mistakes. In the USA especially, patients go through a great deal of unnecessary testing and treatment (source). Even more alarming, medical error is the third leading cause of death in the USA (source). As most people also experience, dealing with billing and health insurance in the USA is a nightmare. Trying to make a rational decision about treatment options is made much more difficult when providers refuse to be upfront about costs ahead of time. Then disputing a refusal of coverage with one's medical insurance company puts one in a labyrinth of time-wasting and inefficiency designed to make people give up instead of carry through to achieve a fair result. These days I try to avoid seeing medical professionals as much as possible -- it has become extremely difficult to trust anyone who is part of the medical system. Yet at the same time, it is possible to get extremely good healthcare in the USA. It takes either luck or skill. 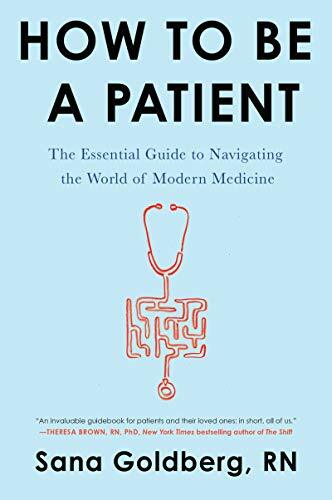 How to Be a Patient provides extremely useful advice about how to make the best of the medical resources available, protecting oneself from medical error and getting good treatment. It is written by Sana Goldberg, an RN nurse who is also pursuing a graduate degree at Yale University. It is divided into ten main parts, 29 chapters, with each chapter itself made of many smaller sections. So it is designed to be dipped into, depending on one's interests and needs. The first part is about how to proceed when you are healthy, preparing for one's medical care and educating oneself. Goldberg recommends that one choose an advocate for oneself -- a friend or family member who can go to important visits with doctors with you, to help you process information, ask questions, and get the best treatment. She also suggests using apps like MyChart to have access to one's medical information -- medical practices will upload test results and important medical information such as one's last annual physical and vaccination information. There's a section on getting genetic testing and another on advance directives, and many others besides. Often the advice is fairly brief when there could be a lot to say about the topics -- obviously books have been written about genetic testing and advance directives. But her advice is sensible. Sometimes the advice is so brief that it doesn't seem very useful. The section ends with a couple of pages on using antidepressants. Goldberg points out that it can take several trials with different antidepressants until the right one is found. She recommends taking a cytochrome p450 genetic test for a person's ability to metabolize medications. This may or may not be good advice. It does correspond with some recently published work and has got positive coverage. However, it seems a little eccentric to highlight this idea which is not yet standard practice. It is likely that there are a number of pieces of advice in this book with which readers may disagree or just may not find useful. However, they will spur readers to think more about their health care options and choices, and one can enter into the spirit of How to Be a Patient without slavishly adopting every suggestion it makes. The second section is on routine health care. Goldberg recommends dressing up well when seeing doctors because it is likely to make them treat you better. That may or may not be true -- she presents no evidence. She also recommends mentally preparing for one's meeting with a doctor while waiting in the waiting room, because otherwise one will be distracted if one has just been reading or scrolling on one's phone. My recent experience has been that waiting rooms are often dominated by a blaring TV that's impossible to turn off, so there's no chance for quiet thought whatever you do. She is on firmer ground when she gets to the part about how to communicate with providers -- here her suggestions seem useful. The sections tend to get shorter as the book proceeds. The third is on dealing with an illness, the fourth on chronic illness, the fifth on emergencies, the sixth on procedures, the seventh on being in hospital, the eighth on helping patients deal with providers, the ninth on being old, young, female, a minority, or belong to a category that is subject to discrimination, and the tenth is on dealing with the insurance industry or Big Pharma. The whole book is about 440 pages, so it has a lot of advice, but obviously it does not cover every single eventuality. There's a lot here that is extremely useful. It's a great book to dip into, and to get some tips from when thinking about a particular issue. Its advice will generally be better than what you get by just putting a question into your Internet search engine, even if what Goldberg says is not necessarily the last word on the topic. I hope How to Be a Patientgenerates plenty of interest and spurs more books addressing similar issues.